Abu Dhabi National Energy (Taqa) has reported profit attributable to equity holders of the parent of Dh398 million ($108.35 million) for 2018, an increase of 149 percent year-on-year. Revenues also grew by 6 percent in 2018 to Dh17.7 billion and EBITDA grew by 6 percent to Dh9.7 billion, mainly driven by an increase in oil and liquid prices in 2018. Free cash-flow generation remained strong at Dh7.1 billion despite higher capital expenditures, which increased from Dh1.3 billion in 2017 to Dh1.7 billion in 2018. Taqa’s capex was completely self-funded by cash generated from the company’s operations and was focused on sustaining and developing its power and water and oil and gas assets, positioning the company to leverage future growth opportunities. 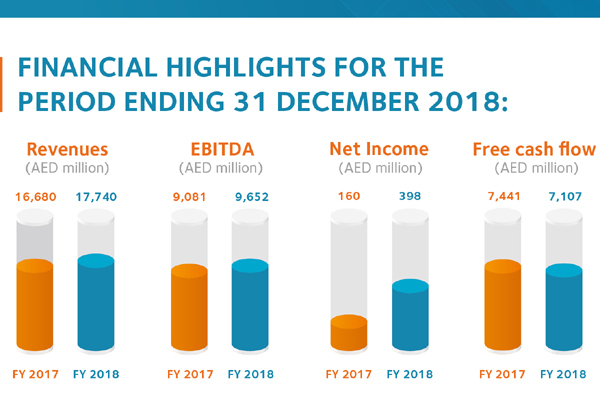 The company reduced its total debt by Dh4 billion, and reduced interest paid by Dh163 million during 2018. The robust financial performance has resulted in improved leverage ratios where net debt-to-EBITDA multiple improved to 6.5 from 7.3 the year before. Taqa also reported a strong liquidity position of Dh13.1 billion, with cash and cash equivalents of Dh3.4 billion and undrawn credit facilities of Dh9.7 billion, giving the company flexibility to address opportunities and challenges as they arise.